1School of Medicine, American University of Beirut, Beirut, Lebanon. 2Department of Surgery, Section of Vascular and Endovascular Surgery, University Medical Center Rizk Hospital, Lebanese American University, P.O. Box 11-3288, Beirut, Lebanon. *Address correspondence and reprints request to: Elias J. Arbid, Department of Surgery, Section of Vascular and Endovascular Surgery, University Medical Center Rizk Hospital, Lebanese American University, P.O. Box 11-3288, Beirut, Lebanon. El Asmar MS, Naoum JJ, Arbid EJ. Vitamin K Dependent Proteins and the Role of Vitamin K2 in the Modulation of Vascular Calcification: A Review. Oman Med J 2014 May; 29(3):172-177. Vascular calcification, a cause of cardiovascular morbidity and mortality, is an actively regulated process involving vitamin K dependent proteins (VKDPs) among others. Vitamin K is an essential micronutrient, present in plants and animal fermented products that plays an important role as a cofactor for the post-translational γ-carboxylation of glutamic acid residues in a number of proteins. These VKDPs require carboxylation to become biologically active, and they have been identified as having an active role in vascular cell migration, angiogenesis and vascular calcification. This paper will review the process of vascular calcification and delineate the role that vitamin K2 plays in the modulation of that process, through the activation of VKDPs. One such VKDP is Matrix Gla Protein (MGP), which when activated inhibits osteogenic factors, thereby inhibiting vascular and soft tissue calcification. Keywords: Vitamin K; Vitamin K2; Menaquinone; Vascular Calcification; Matrix glutamate-Protein (MGP); Warfarin; Vitamin K antagonists. Vitamin K is a lipid-soluble vitamin that was first identified by Henrik Dam in 1929 for its anti-hemorrhagic activities.10-13 It was later coined with the letter K for the Danish word Koagulation. It consists of a group of vitamins that may be further classified as vitamin K1 (VK1) orphylloquinone; vitamin K2 (VK2) ormenaquinone; and vitamin K3 (VK3) or menadione.14 Vitamin K compounds share the same 2-methyl-1, 4-naphthoquinone backbone, yet differ by the substituent on the third carbon of the naphthoquinone ring.15 VK1’s substituent is a phytyl chain on the 3’ position, is mainly found in plants and is involved with photosynthesis.14,16 VK2 is formed mostly by bacteria. Humans may obtain VK2 from fermented dietary sources, such as curd cheese and natto, a Japanese food, or convert high doses of VK1 into VK2 in their bodies.17,18 Vitamin K3 is a synthetic vitamin K with no organic moiety on the 3’ position.14 Vitamin K is mainly found in food in the unreduced quinine (K) form that is in turn reduced into hydroquinone (KH2) in the body. 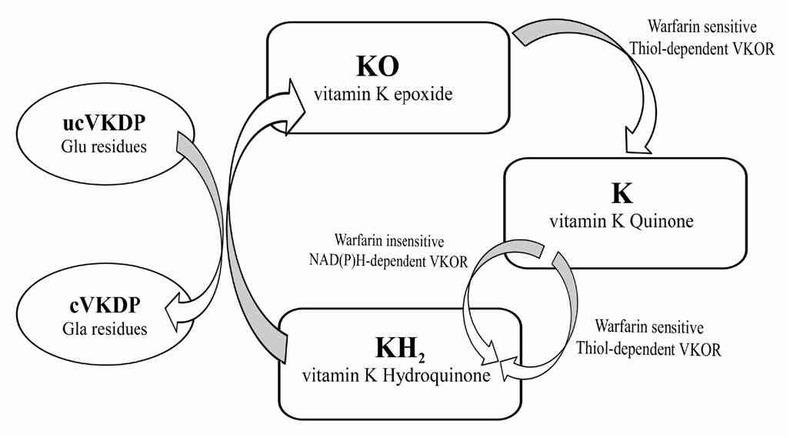 Of importance, Vitamin K is present in significantly lower quantities as compared to the amount of γ-carboxylation that takes place, which suggests that this vitamin is recycled in the body through the vitamin K cycle, presented in Fig. 2. Figure 1: The chemical structures of vitamin K. Vitamin K2 represents a group of molecules with a varying number of isoprene units. Each molecule can be named as mk-n, which represents the number of isoprene units it contains. Figure 2: Vitamin K carboxylation cycle. The oxidation of the hydroquinone form is coupled to the carboxylation of Vitamin K dependent proteins (VKDPs). Vitamin K can be reduced into its hydroquinone form through the action of two enzymes; one of these is sensitive to the action of vitamin K antagonists (VKA) such as warfarin, while the other is not. However, the reduction of vitamin K epoxide can only be achieved by an enzyme sensitive to VKA. This cycle is coupled to the carboxylation of glutamic acid residues in proteins. VKOR: Vitamin K epoxide reductase; ucVKDP: under-carboxylated VKDP; cVKDP: carboxylated VKDP; Glu: glutamic acid; Gla: γ-carboxyglutamic acid. The VKDPs include a number of clotting factors involved in the coagulation cascade (Factors II, VII, IX, X), circulating anti-coagulants (proteins C, S and Z), as well as proteins involved in bone and soft-tissue mineralization like osteocalcin (OC) and MGP respectively. Carboxylated osteocalcin, produced by osteoblasts and carboxylated by Vitamin K, binds to hydroxyapatite in the extracellular matrix of bone. Although its expression has been observed in calcifying vasculature, its biological significance in the progression of calcification remains unknown.19 MGP is of particular interest for the role it plays in vascular calcification. Although it is found in normal vascular smooth cells, MGP is up-regulated during calcification. More recently, additional VKDP have been discovered including the Growth Arrest Specific Gene 6 (Gas-6), the Transmembrane Gla proteins (TMG3 and TMG4), the Proline-Rich Gla proteins (PRGP1 and PRGP2), the Gla-Rich Protein (GRP), periostin and transhyretin. Besides MGP, Gas-6 is also involved in the vasculature, affecting the apoptosis of smooth muscle cells.20 Its function is not limited merely to the vasculature, but it also plays important roles in the nervous system, and in platelet and bone metabolism.21 GRPs, which concentrate in calcified regions, regulate calcium metabolism extracellularly. Angiogenesis and cell movement are regulated by periostin, a VKDP involved in inflammation, asthma and cancer.21-24 Meanwhile, the roles of TMGs, found in different tissues and transhyretin play are currently being investigated. The role that these VKD proteins play in the process of vascular calcification and the potential beneficial effect of Vitamin K2 or menaquinone is being uncovered. In particular, higher levels of dp-ucMGP correlate with a higher risk of mortality in patients with aortic stenosis,25 end-stage renal disease,26 and chronic heart failure.27 Similarly, correlations between MGP levels and degree of calcification are being drawn which may render MGP an early biomarker for disease. Furthermore, VKDP are being used as markers for vitamin K deficiency in various organs of the body. The levels of dephosphorylated, non-carboxylated (dp-ucMGP) are used as a marker for vitamin K deficiency in vasculature, non-carboxylatedosteocalcin (ucOC) for deficiency in bone.28 Another such protein is des-carboxy-prothrombin (PIVKA-II), the under-carboxylated forms of prothrombin, a vitamin K-dependent clotting factor synthesized in the liver. PIVKA-II levels are used as markers of vitamin K deficiency in the liver,29 as well as for peripheral vitamin K deficiency.30 Table 1 summarizes the use of VKD proteins as biomarkers. 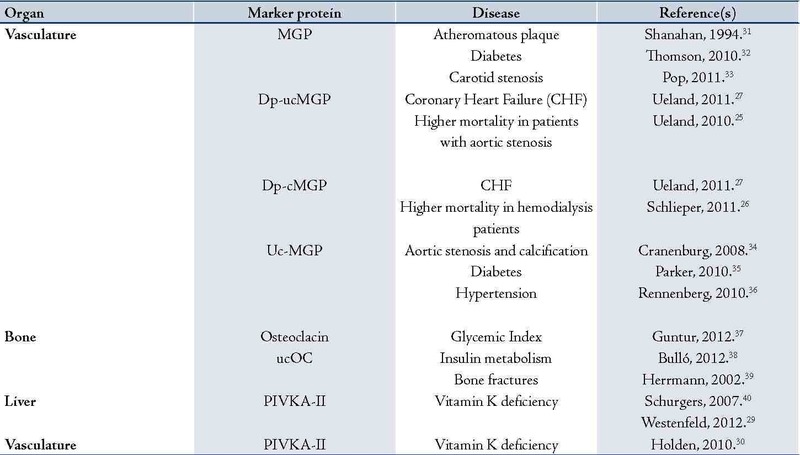 Table 1: VKDP used as markers for Vitamin K deficiency and disease states. The relationship between MGP and Vitamin K lies in the fact that inactive MGP requires vitamin K to carboxylate it for its activation.45,46 Since MGP is a peripheral protein, VK2 the most prevalent form of vitamin K in non-hepatic tissue – is the vitamin mostly available to carboxylate MGP. As calcification develops, MGP is up-regulated in VSMC possibly as part of a negative feed-back mechanism.47 This up-regulation may cause a local deficiency in vitamin K2 status leading to the production of inactive, non-carboxylated MGP (ucMGP). Phosphorylated MGP remains attached to the growing calcification crystals while dephosphorylated MGP (dp-MGP) is released into the circulation. Levels of dp-MGP in circulation can be measured and have been found to correlate with cardiovascular morbidity. Figure 3: The process of vascular calcification. Mineralization of the ECM induces an increase in the expression of MGP as a negative feedback mechanism. The up-regulation of MGP causes a relative deficiency in vitamin K which, if not replenished, will lead to inactive MGP and vascular calcification. A decrease in the expression of calcification inhibitors such as OPN, Osteopontin; PPi, pyrophosphate; BMP-2 and BMP-4, Bone Morphogenetic Protein-2 and 4, resepctively, may also result in vascular calcification. Diabetic patients suffer from calcification in the tunica media mainly in the thoracic aorta, coronary arteries and tibial arteries.68,69 The possibility of calcification in these patients is four times higher than in non-diabetics.70 The incidence of advanced glycation end-products (AGE), which correlates with the occurrence of coronary artery calcification (CAC), may be induced by the elevated blood glucose levels.71,72 Alternatively, calcification in these patients may be triggered by vascular inflammation or the formation of foam cells from macrophages that in turn contribute to the calcification process.73 MGP levels were found to be higher in diabetic patients,32 with higher ucMGP levels indicating higher risks of mitral arterial calcification a trend that was contrary to that observed in non-diabetics.35 This indicates that vitamin K dependent proteins may play a role in the observed incidence of calcification in diabetics, an effect which may be counteracted with sufficient vitamin K treatment. 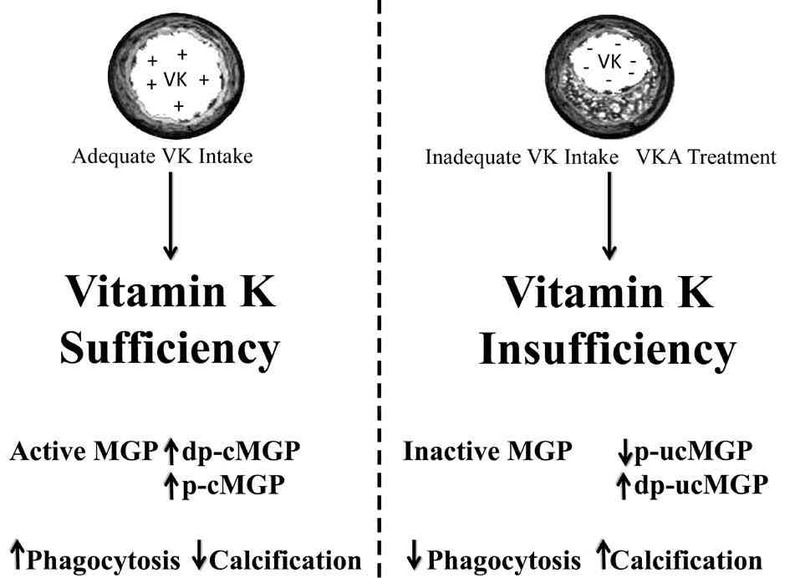 Figure 4: The effect of vitamin K on MGP and vascular calcification. Different species of MGP are affected by the presence of vitamin K. These include Dp-cMGP, non-phosphorylated carboxylated MGP; p-cMGP, phosphorylated MGP; p-ucMGP, phosphorylated-non-carboxylated MGP; dp-ucMGP, non-phosphorylated non-carboxylated MGP. Vitamin K2 has promising potential to be used as treatment or prevention for the development of vascular calcification especially in at risk patient groups with high incidence of calcification or vitamin K deficiency. Through its peripheral distribution in low density lipoproteins, VK2 exercises its effect by activating various VKDPs including the soft-tissue calcification inhibitor MGP. Clinical trials looking into the effect of VK2 on vascular calcification and its beneficial cardiovascular effects will help elucidate its potential role as a therapeutic strategy. The authors certify that there is no conflict of interest and no funding was received for this work. 1. Edmonds ME. Medial arterial calcification and diabetes mellitus. Z Kardiol 2000;89(Suppl 2):101-104. 2. Abedin M, Tintut Y, Demer LL. Vascular calcification: mechanisms and clinical ramifications. Arterioscler Thromb Vasc Biol 2004 Jul;24(7):1161-1170. 3. Proudfoot D, Shanahan CM, Weissberg PL. Vascular calcification: new insights into an old problem. J Pathol 1998 May;185(1):1-3. 4. Price PA, Chan WS, Jolson DM, Williamson MK. The elastic lamellae of devitalized arteries calcify when incubated in serum: evidence for a serum calcification factor. Arterioscler Thromb Vasc Biol 2006 May;26(5):1079-1085. 5. Shanahan CM, Crouthamel MH, Kapustin A, Giachelli CM. Arterial calcification in chronic kidney disease: key roles for calcium and phosphate. Circ Res 2011 Sep;109(6):697-711. 6. Johnson RC, Leopold JA, Loscalzo J. Vascular calcification: pathobiological mechanisms and clinical implications. Circ Res 2006 Nov;99(10):1044-1059. 7. Rennenberg RJ, Schurgers LJ, Kroon AA, Stehouwer CD. Arterial calcifications. J Cell Mol Med 2010 Sep;14(9):2203-2210. 8. Giachelli CM. Vascular calcification mechanisms. J Am Soc Nephrol 2004 Dec;15(12):2959-2964. 9. Demer LL, Tintut Y. Vascular calcification: pathobiology of a multifaceted disease. Circulation 2008 Jun;117(22):2938-2948. 10. Dam H. The antihaemorrhagic vitamin of the chick. Biochem J 1935 Jun;29(6):1273-1285. 11. Dam H, Schönheyder F. A deficiency disease in chicks resembling scurvy. Biochem J 1934;28(4):1355-1359. 12. Schønheyder F. The quantitative determination of vitamin K. I. Biochem J 1936 May;30(5):890-896. 13. Dam H, Schønheyder F. The occurrence and chemical nature of vitamin K. Biochem J 1936 May;30(5):897-901. 14. International Agengy for Research on Cancer (IARC). Vitamin K. Monographs on the Evaluation of Carcinogenic Risks to Humans Volume 76-Some Antiviral and Antineoplastic Drugs, and Other Pharmaceutical Agents. Lyon, 2000; p.417-473. 15. Jacobsen BK, Dam H. Vitamin K in bacteria. Biochim Biophys Acta 1960 May;40:211-216. 16. Shearer MJ, Allan V, Haroon Y, Barkhan P. Vitamin K metabolism and Vitamin K dependent proteins. Yale J Biol Med 1980;53:317-327. 17. Thijssen HH, Drittij-Reijnders MJ. 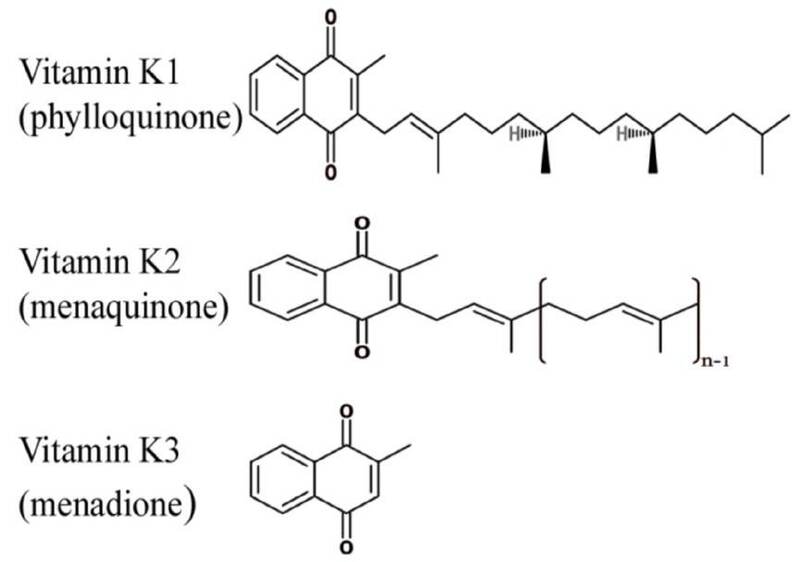 Vitamin K distribution in rat tissues: dietary phylloquinone is a source of tissue menaquinone-4. Br J Nutr 1994 Sep;72(3):415-425. 18. Thijssen HH, Drittij-Reijnders MJ, Fischer MA. Phylloquinone and menaquinone-4 distribution in rats: synthesis rather than uptake determines menaquinone-4 organ concentrations. J Nutr 1996 Feb;126(2):537-543. 19. Kapustin AN, Shanahan CM. Osteocalcin: a novel vascular metabolic and osteoinductive factor? Arterioscler Thromb Vasc Biol 2011 Oct;31(10):2169-2171. 20. Danziger J. Vitamin K-dependent proteins, warfarin, and vascular calcification. Clin J Am Soc Nephrol 2008 Sep;3(5):1504-1510. 21. Ferland G. Vitamin K. In: Erdman JW, Macdonald IA, ZeiselSH, ed. Present Knowledge in Nutrition. 10th ed. International Life Sciences Institute Press, 2012. p.230-247. 22. Masuoka M, Shiraishi H, Ohta S, Suzuki S, Arima K, Aoki S, et al. Periostin promotes chronic allergic inflammation in response to Th2 cytokines. J Clin Invest 2012 Jul;122(7):2590-2600. 23. Kyutoku M, Taniyama Y, Katsuragi N, Shimizu H, Kunugiza Y, Iekushi K, et al. Role of periostin in cancer progression and metastasis: inhibition of breast cancer progression and metastasis by anti-periostin antibody in a murine model. Int J Mol Med 2011 Aug;28(2):181-186. 24. Jia G, Erickson RW, Choy DF, Mosesova S, Wu LC, Solberg OD, et al; Bronchoscopic Exploratory Research Study of Biomarkers in Corticosteroid-refractory Asthma (BOBCAT) Study Group. Periostin is a systemic biomarker of eosinophilic airway inflammation in asthmatic patients. J Allergy Clin Immunol 2012 Sep;130(3):647-654, e10. 25. Ueland T, Gullestad L, Dahl CP, Aukrust P, Aakhus S, Solberg OG, et al. Undercarboxylated matrix Gla protein is associated with indices of heart failure and mortality in symptomatic aortic stenosis. J Intern Med 2010 Nov;268(5):483-492. 26. Schlieper G, Westenfeld R, Krüger T, Cranenburg EC, Magdeleyns EJ, Brandenburg VM, et al. Circulating nonphosphorylated carboxylated matrix gla protein predicts survival in ESRD. J Am Soc Nephrol 2011 Feb;22(2):387-395. 27. Ueland T, Dahl CP, Gullestad L, Aakhus S, Broch K, Skårdal R, et al. Circulating levels of non-phosphorylated undercarboxylated matrix Gla protein are associated with disease severity in patients with chronic heart failure. Clin Sci (Lond) 2011 Aug;121(3):119-127. 28. Vergnaud P, Garnero P, Meunier PJ, Bréart G, Kamihagi K, Delmas PD. Undercarboxylated osteocalcin measured with a specific immunoassay predicts hip fracture in elderly women: the EPIDOS Study. J Clin Endocrinol Metab 1997 Mar;82(3):719-724. 29. Westenfeld R, Krueger T, Schlieper G, Cranenburg EC, Magdeleyns EJ, Heidenreich S, et al. Effect of vitamin K2 supplementation on functional vitamin K deficiency in hemodialysis patients: a randomized trial. Am J Kidney Dis 2012 Feb;59(2):186-195. 30. Holden RM, Morton AR, Garland JS, Pavlov A, Day AG, Booth SL. Vitamins K and D status in stages 3-5 chronic kidney disease. Clin J Am Soc Nephrol 2010 Apr;5(4):590-597. 31. Shanahan CM, Cary NR, Metcalfe JC, Weissberg PL. High expression of genes for calcification-regulating proteins in human atherosclerotic plaques. J Clin Invest 1994 Jun;93(6):2393-2402. 32. Thomsen SB, Rathcke CN, Zerahn B, Vestergaard H. Increased levels of the calcification marker matrix Gla Protein and the inflammatory markers YKL-40 and CRP in patients with type 2 diabetes and ischemic heart disease. Cardiovasc Diabetol 2010;9:86. 33. Pop D, Sitar-Taut A, Gligor E, Bodizs G, Cebanu M, Buduru S, et al. The relationship between matrix GLA protein (MGP) and carotid stenosis. Rev Rom. De med De lab 2011;19:169-175. 34. Cranenburg EC, Vermeer C, Koos R, Boumans ML, Hackeng TM, Bouwman FG, et al. The circulating inactive form of matrix Gla Protein (ucMGP) as a biomarker for cardiovascular calcification. J Vasc Res 2008;45(5):427-436. 35. Parker BD, Schurgers LJ, Vermeer C, Schiller NB, Whooley MA, Ix JH. The association of uncarboxylated matrix Gla protein with mitral annular calcification differs by diabetes status: The Heart and Soul study. Atherosclerosis 2010 May;210(1):320-325. 36. Rennenberg RJ, de Leeuw PW, Kessels AG, Schurgers LJ, Vermeer C, van Engelshoven JM, et al. Calcium scores and matrix Gla protein levels: association with vitamin K status. Eur J Clin Invest 2010 Apr;40(4):344-349. 37. Guntur AR, Rosen CJ. Bone as an endocrine organ. Endocr Pract 2012 Sep-Oct;18(5):758-762. 38. Bulló M, Moreno-Navarrete JM, Fernández-Real JM, Salas-Salvadó J. Total and undercarboxylated osteocalcin predict changes in insulin sensitivity and β cell function in elderly men at high cardiovascular risk. Am J Clin Nutr 2012 Jan;95(1):249-255. 39. Herrmann M, Klitscher D, Georg T, Frank J, Marzi I, Herrmann W. Different kinetics of bone markers in normal and delayed fracture healing of long bones. Clin Chem 2002 Dec;48(12):2263-2266. 40. Schurgers LJ, Teunissen KJ, Hamulyák K, Knapen MH, Vik H, Vermeer C. Vitamin K-containing dietary supplements: comparison of synthetic vitamin K1 and natto-derived menaquinone-7. Blood 2007 Apr;109(8):3279-3283. 41. Levy RJ, Zenker JA, Lian JB. Vitamin K-dependent calcium binding proteins in aortic valve calcification. J Clin Invest 1980 Feb;65(2):563-566. 42. Luo G, Ducy P, McKee MD, Pinero GJ, Loyer E, Behringer RR, et al. Spontaneous calcification of arteries and cartilage in mice lacking matrix GLA protein. Nature 1997 Mar;386(6620):78-81. 43. Munroe PB, Olgunturk RO, Fryns JP, Van Maldergem L, Ziereisen F, Yuksel B, et al. Mutations in the gene encoding the human matrix Gla protein cause Keutel syndrome. Nat Genet 1999 Jan;21(1):142-144. 44. Schafer C, Heiss A, Schwarz A, Westenfeld R, Ketteler M, Floege J, et al. The serum protein alpha 2-Heremans-Schmid glycoprotein/fetuin-A is a systemically acting inhibitor of ectopic calcification. J Clin Invest 2003 Aug;112(3):357-366. 45. Wallin R, Cain D, Hutson SM, Sane DC, Loeser R. Modulation of the binding of matrix Gla protein (MGP) to bone morphogenetic protein-2 (BMP-2). Thromb Haemost 2000 Dec;84(6):1039-1044. 46. Wallin R, Schurgers L, Wajih N. Effects of the blood coagulation vitamin K as an inhibitor of arterial calcification. Thromb Res 2008;122(3):411-417. 47. Proudfoot D, Shanahan CM. Molecular mechanisms mediating vascular calcification: role of matrix Gla protein. Nephrology (Carlton) 2006 Oct;11(5):455-461. 48. Price PA, Rice JS, Williamson MK. Conserved phosphorylation of serines in the Ser-X-Glu/Ser(P) sequences of the vitamin K-dependent matrix Gla protein from shark, lamb, rat, cow, and human. Protein Sci 1994 May;3(5):822-830. 49. Price PA, Chan WS, Jolson DM, Williamson MK. The elastic lamellae of devitalized arteries calcify when incubated in serum: evidence for a serum calcification factor. Arterioscler Thromb Vasc Biol 2006 May;26(5):1079-1085. 50. Price PA, Faus SA, Williamson MK. Warfarin causes rapid calcification of the elastic lamellae in rat arteries and heart valves. Arterioscler Thromb Vasc Biol 1998 Sep;18(9):1400-1407. 51. Zebboudj AF, Imura M, Boström K. Matrix GLA protein, a regulatory protein for bone morphogenetic protein-2. J Biol Chem 2002 Feb;277(6):4388-4394. 52. Boström K, Tsao D, Shen S, Wang Y, Demer LL. Matrix GLA protein modulates differentiation induced by bone morphogenetic protein-2 in C3H10T1/2 cells. J Biol Chem 2001 Apr;276(17):14044-14052. 53. Proudfoot D, Skepper JN, Hegyi L, Bennett MR, Shanahan CM, Weissberg PL. Apoptosis regulates human vascular calcification in vitro: evidence for initiation of vascular calcification by apoptotic bodies. Circ Res 2000 Nov;87(11):1055-1062. 54. Ahrens M, Ankenbauer T, Schröder D, Hollnagel A, Mayer H, Gross G. Expression of human bone morphogenetic proteins-2 or -4 in murine mesenchymal progenitor C3H10T1/2 cells induces differentiation into distinct mesenchymal cell lineages. DNA Cell Biol 1993 Dec;12(10):871-880. 55. Nishimoto SK, Nishimoto M. Matrix Gla protein C-terminal region binds to vitronectin. Co-localization suggests binding occurs during tissue development. Matrix Biol 2005 Aug;24(5):353-361. 56. Isik FF, Gibran NS, Jang YC, Sandell L, Schwartz SM. Vitronectin decreases microvascular endothelial cell apoptosis. J Cell Physiol 1998 May;175(2):149-155. 57. Saito E, Wachi H, Sato F, Sugitani H, Seyama Y. Treatment with vitamin k(2) combined with bisphosphonates synergistically inhibits calcification in cultured smooth muscle cells. J Atheroscler Thromb 2007 Dec;14(6):317-324. 58. Kawashima H, Nakajima Y, Matubara Y, Nakanowatari J, Fukuta T, Mizuno S, et al. Effects of vitamin K2 (menatetrenone) on atherosclerosis and blood coagulation in hypercholesterolemic rabbits. Jpn J Pharmacol 1997 Oct;75(2):135-143. 59. Geleijnse JM, Vermeer C, Grobbee DE, Schurgers LJ, Knapen MH, van der Meer IM, et al. Dietary intake of menaquinone is associated with a reduced risk of coronary heart disease: the Rotterdam Study. J Nutr 2004 Nov;134(11):3100-3105. 60. Beulens JW, Bots ML, Atsma F, Bartelink ML, Prokop M, Geleijnse JM, et al. High dietary menaquinone intake is associated with reduced coronary calcification. Atherosclerosis 2009 Apr;203(2):489-493. 61. Beulens JW, Booth SL, van den Heuvel EG, Stoecklin E, Baka A, Vermeer C. The role of menaquinones (vitamin K₂) in human health. Br J Nutr 2013 Oct;110(8):1357-1368. 62. Alrasadi K, Alwaili K, Awan Z, Valenti D, Couture P, Genest J. Aortic calcifications in familial hypercholesterolemia: potential role of the low-density lipoprotein receptor gene. Am Heart J 2009 Jan;157(1):170-176. 63. Awan Z, Alrasadi K, Francis GA, Hegele RA, McPherson R, Frohlich J, et al. Vascular calcifications in homozygote familial hypercholesterolemia. Arterioscler Thromb Vasc Biol 2008 Apr;28(4):777-785. 64. Awan Z, Denis M, Bailey D, Giaid A, Prat A, Goltzman D, et al. The LDLR deficient mouse as a model for aortic calcification and quantification by micro-computed tomography. Atherosclerosis 2011 Dec;219(2):455-462. 65. London GM, Guérin AP, Marchais SJ, Métivier F, Pannier B, Adda H. Arterial media calcification in end-stage renal disease: impact on all-cause and cardiovascular mortality. Nephrol Dial Transplant 2003 Sep;18(9):1731-1740. 66. Block GA. Prevalence and clinical consequences of elevated Ca x P product in hemodialysis patients. Clin Nephrol 2000 Oct;54(4):318-324. 67. Theuwissen E, Cranenburg EC, Knapen MH, Magdeleyns EJ, Teunissen KJ, Schurgers LJ, et al. Low-dose menaquinone-7 supplementation improved extra-hepatic vitamin K status, but had no effect on thrombin generation in healthy subjects. Br J Nutr 2012 Nov;108(9):1652-1657. 68. Olson JC, Edmundowicz D, Becker DJ, Kuller LH, Orchard TJ. Coronary calcium in adults with type 1 diabetes: a stronger correlate of clinical coronary artery disease in men than in women. Diabetes 2000 Sep;49(9):1571-1578. 69. Lehto S, Niskanen L, Suhonen M, Rönnemaa T, Laakso M. Medial artery calcification. A neglected harbinger of cardiovascular complications in non-insulin-dependent diabetes mellitus. Arterioscler Thromb Vasc Biol 1996 Aug;16(8):978-983. 70. Neubauer B. A quantitative study of peripheral arterial calcification and glucose tolerance in elderly diabetics and non-diabetics. Diabetologia 1971 Dec;7(6):409-413. 71. Conway B, Edmundowicz D, Matter N, Maynard J, Orchard T. Skin fluorescence correlates strongly with coronary artery calcification severity in type 1 diabetes. Diabetes Technol Ther 2010 May;12(5):339-345. 72. Basta G, Corciu AI, Vianello A, Del Turco S, Foffa I, Navarra T, et al. Circulating soluble receptor for advanced glycation end-product levels are decreased in patients with calcific aortic valve stenosis. Atherosclerosis 2010 Jun;210(2):614-618. 73. Zhu D, Mackenzie NC, Farquharson C, Macrae VE. 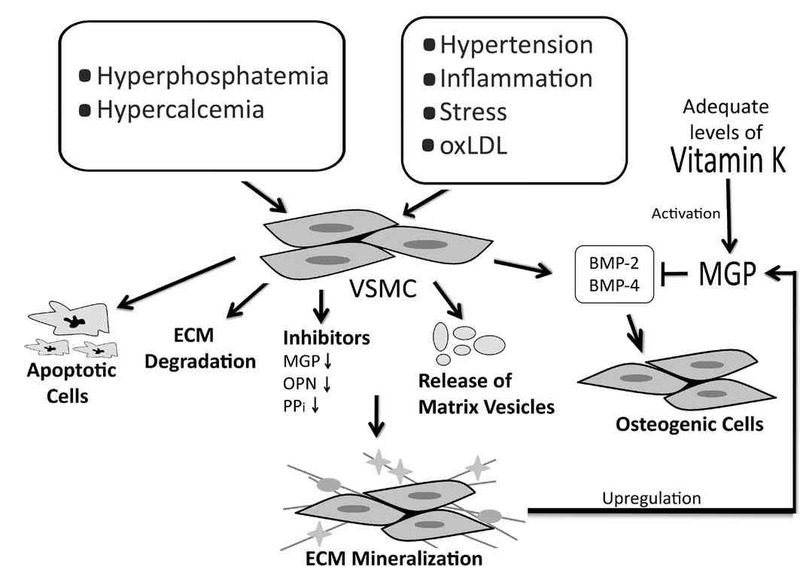 Mechanisms and clinical consequences of vascular calcification. Front Endocrinol (Lausanne) 2012;3:95. 74. Erkkilä AT, Booth SL, Hu FB, Jacques PF, Lichtenstein AH. Phylloquinone intake and risk of cardiovascular diseases in men. Nutr Metab Cardiovasc Dis 2007 Jan;17(1):58-62. 75. Schurgers LJ, Vermeer C. Differential lipoprotein transport pathways of K-vitamins in healthy subjects. Biochim Biophys Acta 2002 Feb;1570(1):27-32. 76. Rennenberg RJ, van Varik BJ, Schurgers LJ, Hamulyak K, Ten Cate H, Leiner T, et al. Chronic coumarin treatment is associated with increased extracoronary arterial calcification in humans. Blood 2010 Jun;115(24):5121-5123. 77. Lerner RG, Aronow WS, Sekhri A, Palaniswamy C, Ahn C, Singh T, et al. Warfarin use and the risk of valvular calcification. J Thromb Haemost 2009 Dec;7(12):2023-2027. 78. Weijs B, Blaauw Y, Rennenberg RJ, Schurgers LJ, Timmermans CC, Pison L, et al. Patients using vitamin K antagonists show increased levels of coronary calcification: an observational study in low-risk atrial fibrillation patients. Eur Heart J 2011 Oct;32(20):2555-2562. 79. Cranenburg EC, Koos R, Schurgers LJ, Magdeleyns EJ, Schoonbrood TH, Landewé RB, et al. Characterisation and potential diagnostic value of circulating matrix Gla protein (MGP) species. Thromb Haemost 2010 Oct;104(4):811-822. 80. Bushra R, Aslam N, Khan AY. Food-drug interactions. Oman Med J 2011 Mar;26(2):77-83.